Sometimes newcomers to a technical arts ministry are intimidated, overwhelmed or confused as to whether or not they are needed and how best to get assimilated to the team. At my church, I have 3 “gateway ministries” that are a quick way for someone to get plugged in. These positions are camera, graphics and stage manager. This is not to say that these positions are not important, needed or difficult to do. These are just the best 3 options to quickly start out on the team. The other team positions are hand-picked after one has served in one of these “gateway ministries” for a healthy season and has excelled at them. The truth is that we can have someone trained on graphics, camera or stage managing in 2 weeks (2 Wed. night rehearsals). This is just getting them up-and-running and able to dive in and be a part of the team. We LOVE welcoming new people to the team! The other truth is that it takes months and sometimes years to be GOOD at graphics, camera and stage managing. When someone shows great promise and a desire to try something different, they become a potential Service Director. When a camera operator does well on camera for a long time and has a knack for technical things, they get moved to our Video Engineer/Shader position. One current camera operator is being groomed as a Video Director, but is starting out as a Video Engineer/Shader to be in the control room during the “heat of things”. Another newcomer is being considered as a potential future Video Director and is spending time in “the empty chair“. Some camera operators make good shaders, some don’t. Some shaders go on to be Video Directors, some don’t. This a little behind-the-scenes look at how people get involved and how we fill non-gateway positions like Video Engineer/Shader, Video Director and Service Director. The Producer is also a hand-picked postion. What’s the assimilation process like at your church? I’m the Director of Technical Arts at my church (Bent Tree), so I oversee all the technical arts ministries. I’m coming into a new and long-awaited season of being able to put up the blueprints, take off my hard hat and be the pastor, shepherd and leader I am called to be. Praise God, this Sunday is Bent Tree’s official “Grand Opening”! After being in construction for 3 years, we are finally opening our doors wide to the community. Many close to me have pointed out that I’ve been a little busy, a little (that’s an understatement) stressed and a little preoccupied with work the last year. I’m hesitantly glad to say that I think I’ve made it through the valley and am looking forward to moving forward as a church and as a Technical Arts ministry. So, currently there are 16 “black shirts” serving around the main worship center on a Sunday. As you see, I hope to increase to at least 18 in the next few months. I’ve said it many times before and I’ll say it many more times: YOU MUST CONSTANTLY RECRUIT! For various reasons, you have to keep recruiting. Once we have more than enough graphic operators, we’ll split and have 2 graphic operators each week. If we had too many of them, we’d split again and have one for an effects screen (which we’re working on). If we got too many camera operators, then we’d add cameras 4 and 5 on stage left and stage right. One note: all 16 are at rehearsal on Wed. night: EVERYONE. We do a complete run-through with full music, tech and any other elemenHold high the value of rehearsal.ts that might happen (drama, etc.) each Wed. night from 7p to 9p. That’s a blog post unto itself.Â Raise the bar. Set a standard for quality and value each person’s time and commitment. I don’t think it’s right for one person to miss and 15 others give up their time and be at rehearsal. ALL 16 must be there. Committing to serve on a given week means you’re “on” for Wed. night and Sunday. Our volunteers mark their availability via Planning Center Online – that’s another blog post all to itself. What a resource! Usually I’m walking new team members around on Wed. nights, giving them the behind-the-scenes tour, introducing them to the team and passing them on to a volunteer team leader that trains them on their particulal place of service. 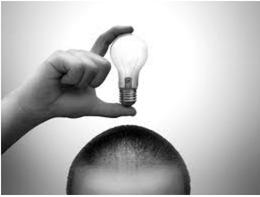 * Tomorrow’s blog will be about how new people get plugged in and where/how I start them out. Another note: What I listed above is just what takes place in the main worship center. I’m working on a new position for an AV Coordinator to oversee the equipment throughout our campus. In putting together a job description, I realized we have 13 different venues (22 projectors) across our campus. On a Sunday, “tech” is happening in classrooms, the Treehouse, the gym, the main worship center and our new FX Live family production that kicked off this past Sunday. The FX Live team has their own full tech team and uses IMAG (Image Magnification) in their production as well. NOTE: FX Live has 2 cameras right now (the same ones we used in our old worship center). I’ll blog more about FX Live another time. You may have heard of North Point’s KidStuf – FX Live (FX stands for family experience) is based off of KidStuf – featuring worship for kids and parents led by singers, dancers and actors. They have a newly built 2 story theater/stage. 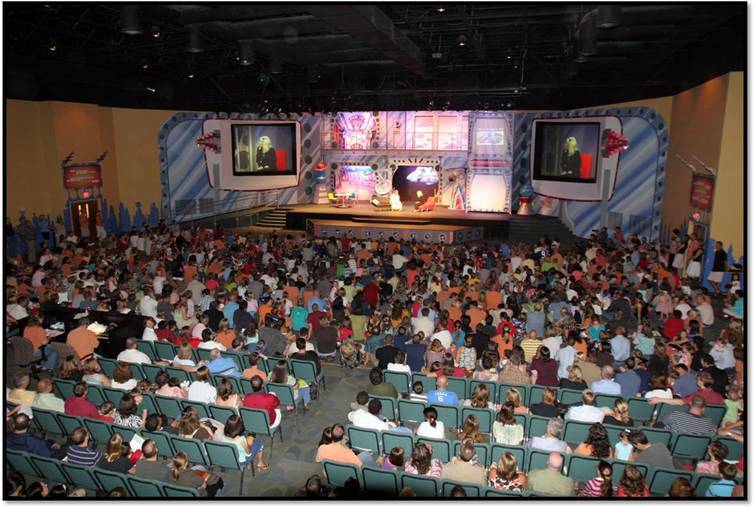 I heard this past week that we have the largest family production theater in the country. Estimates are that we still turned away 200 people! We are meeting and planning on how to remedy this. More tomorrow on what I call “gateway ministries”.Â SO.. what does Sunday look like at your church?